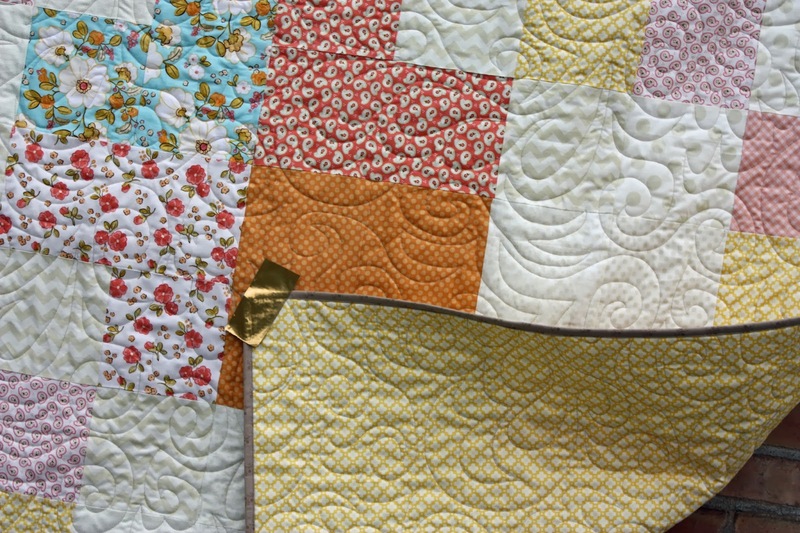 It seems that I have been able to finish some quilts this week. 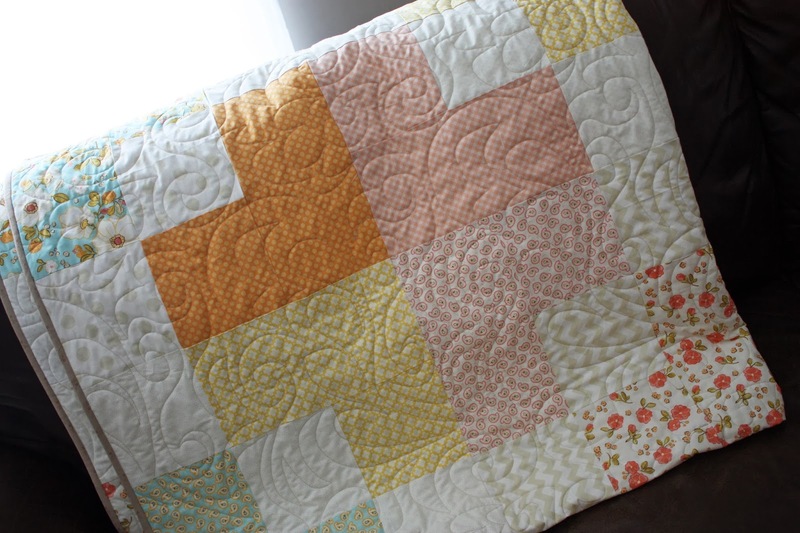 In fact I was able to make this sweet quilt in a day (less than 24 hrs). 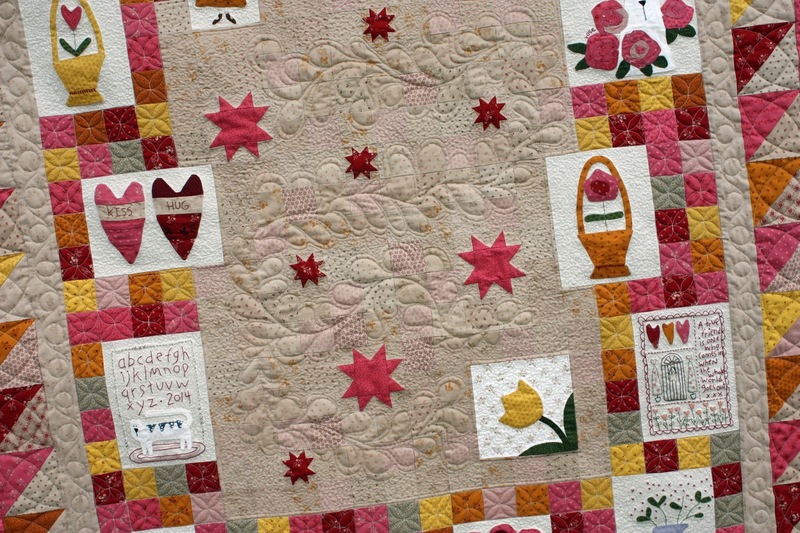 I wanted to make this for a very deserving sweet person and amongst projects I just didn't have a lot of time… so I opted for a simple design in a large block size. My kids helped me lay the blocks out so that no two matched, which can always be a little tricky. Then on the quilting frame off and bound and delivered. Yellow was the color to keep in mind and so it is backed in that color (all fabrics are Riley Blake fyi). 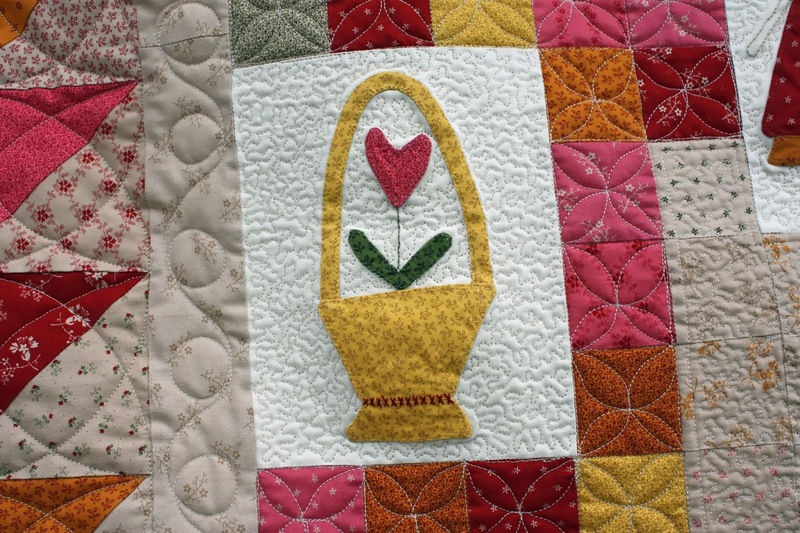 Ya know I have been thinking why don't I make more of these short commitment quilts? Well I am headed to a retreat soon and that is the plan to make a few fun fast quilts that let the fabric pop a little. 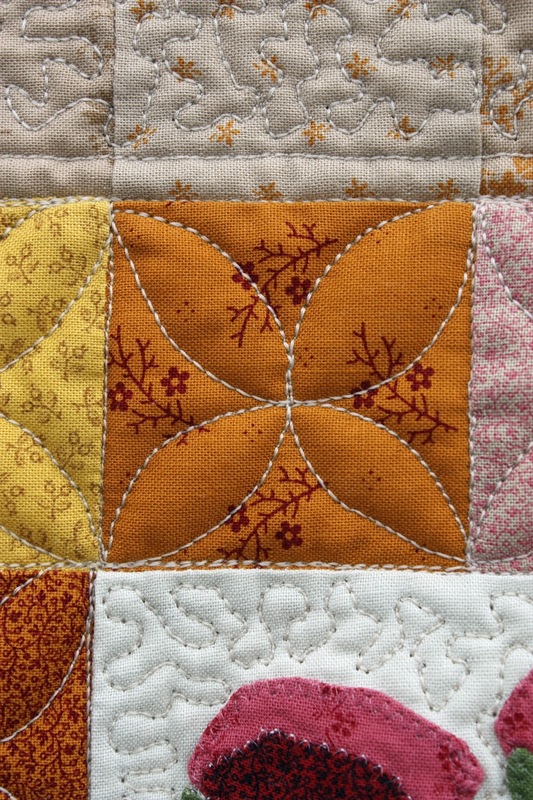 Obviously there are quite a few different types of quilts out there. I try to give them all a shot. It is good to stretch ones talents. So, I am thinking that I need a few more couch quilts in this size. Having said that, our family is a little partial to tied couch quilts but there might be a little wiggle room. 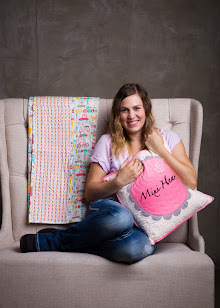 This thought has been crossing my mind recently to try some of these size quilts (a large couch quilt) if anything to add to the room decor. Mind you I do have a LOT of quilted displays as it is… but cousins have inspired me to look at this concept a little more closely and perhaps add a few more quilts to a quilty room. 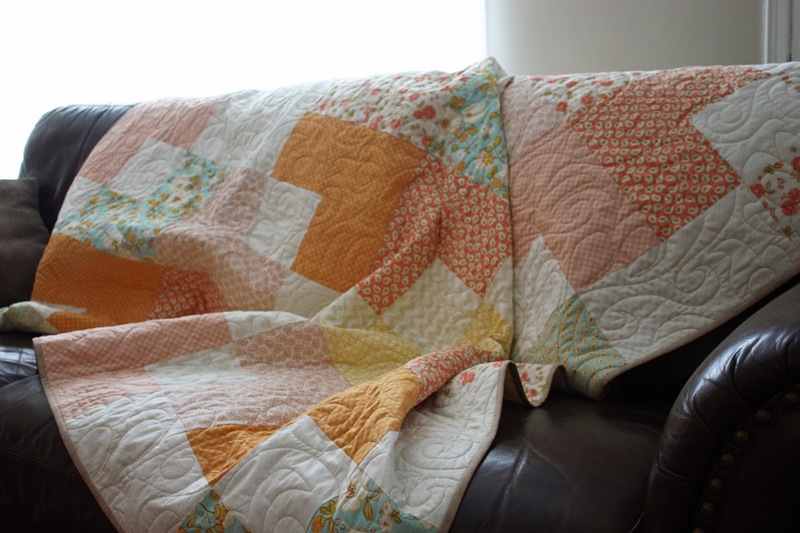 So I borrowed this little quilt for a couple minutes to feed that thought :) One day I will be a little more spread out over a little bit larger home and then maybe it won't look too quilty but until then I am happy with just seeing the cute things I get to sew. So stay tuned to see some new additions of this variety in the near future. In contrast to the fun fast projects the other awesome finish this week was our Sew Need a Break pattern for 2014. This sat on the machine for a bit because I had built up some expectations to quilting and I didn't know if I was going to live up to those expectations. 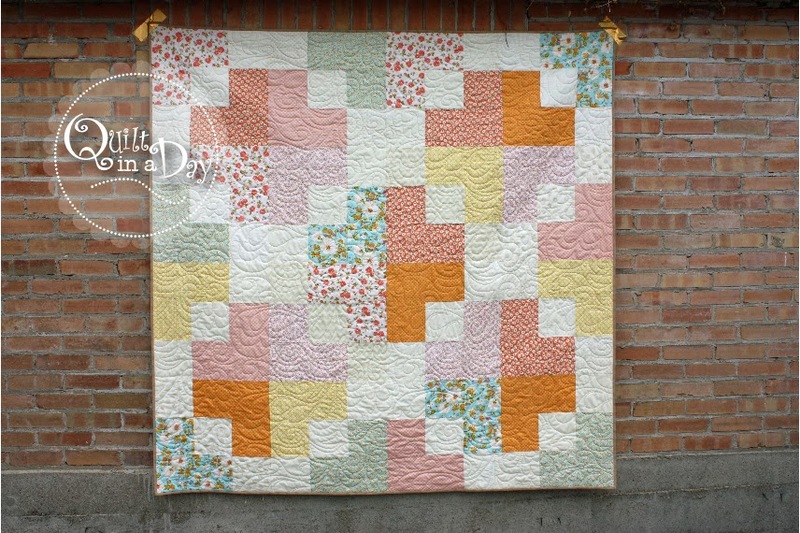 But the Quilt in a Day needed to be worked in which gave me the push to get the quilting going on this little beauty. I included feathers and I wouldn't say that I am amazing at them… yet. 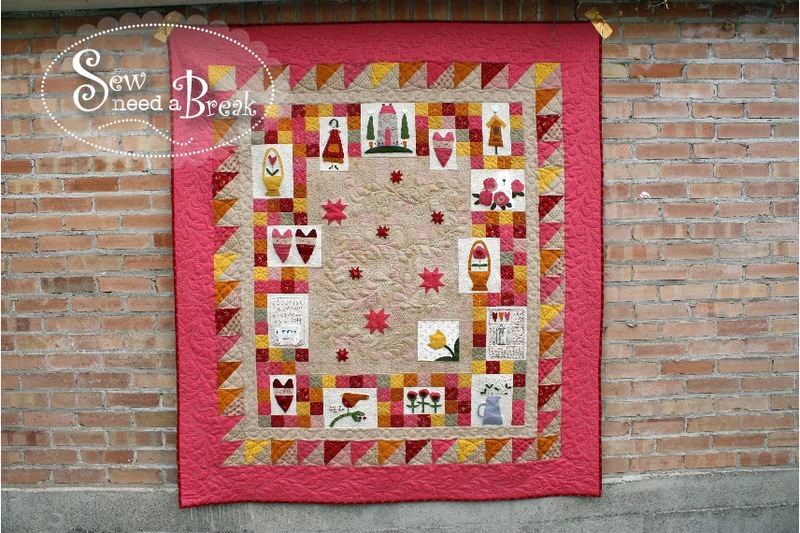 The vision that I had in mind was inspired by a quilt I saw at Quilt Market this fall in the Fig Tree booth. 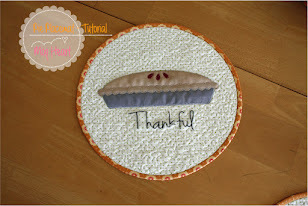 I just really wanted to do the same small stipple in the center with a feather bursting out. I think I accomplished what I had in mind. Although it was very nerve racking to commit to something that would be such a focal point in the quilt. 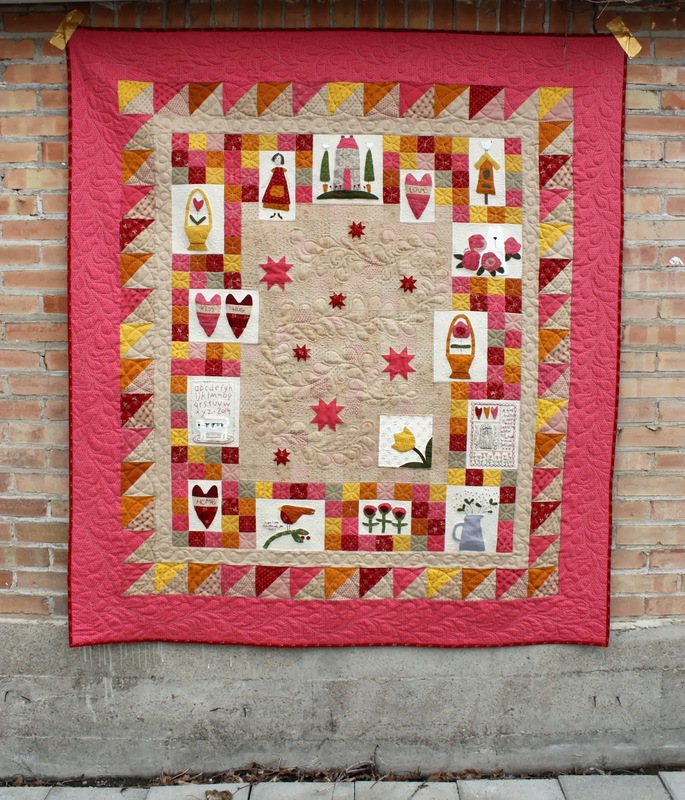 Another thing to point out is that I "WON" a quilt block while at Quilt Market in a schoolhouse series. The crazy thing about this is that I had put it away completely forgetting about it until after I ordered the fabric for our Sew Need a Break group. Well low and behold it was in the SAME fabric line. Crazy. 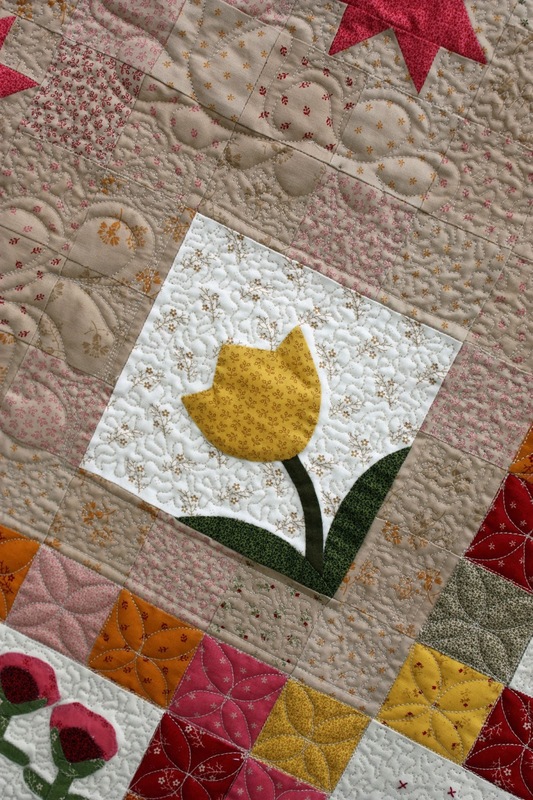 Not to mention that it was such a cute tulip that fit perfectly into the quilt that was chosen for our group. More crazy. I did a little rearranging where the flower sat in the center as well. I need to do some research so I can send pics to the sweet person that hand appliquéd this flower. Did I also mention that tulips are one of my favorite flowers. I am a very simple gal so that might be the reason why and I am sure it has something to do with the fact that my grandparents had tulips growing in their flower beds every year in a wonderful assortment of colors as well. So this is still my favorite block. The heart flower. I guess you could say that I cheated a little on the borders by following a design, but I was already having a heart attack as it was with everything else. I'm looking forward in the future where this is not a problem. Then on the half square triangles I just used my circle ruler to make the geometric design. 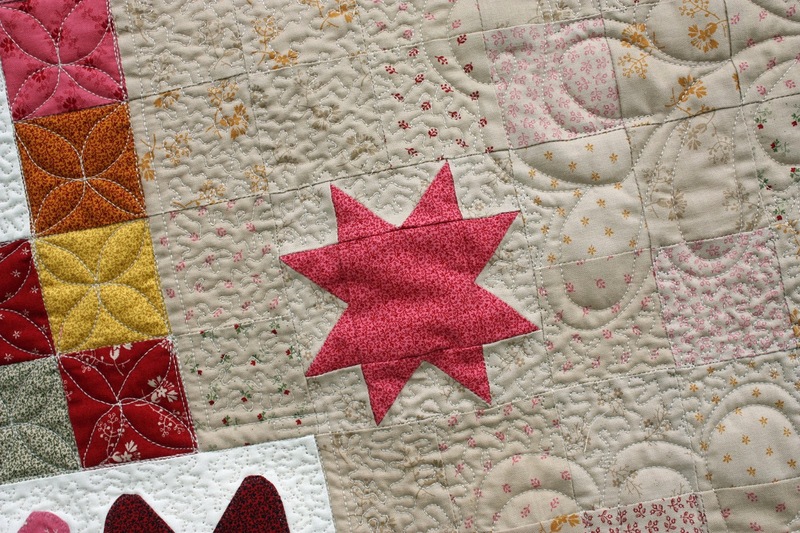 Here is another close up of a pink ohio star and if you peek to the lower left there would be a little orange peel that wouldn't be my worst but you can get an idea of how some of them got a little wonky. All in all this was a fun pattern for me. 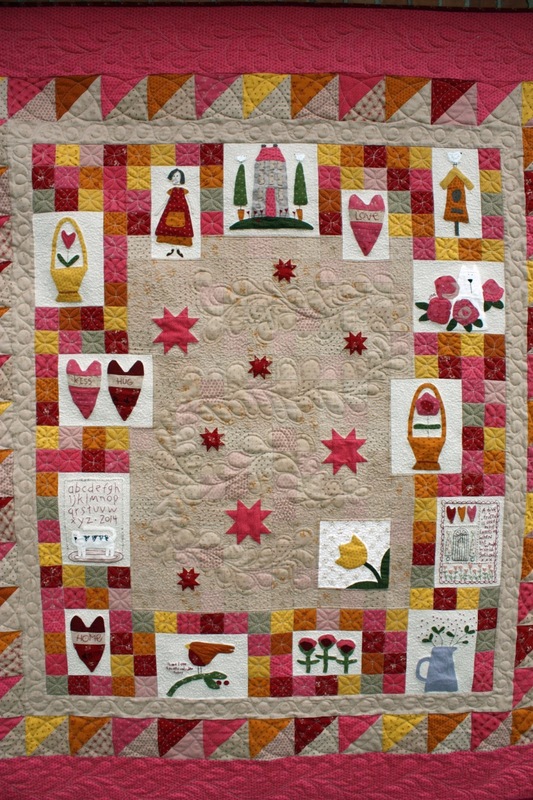 I loved this designers style and it definitely is a unique quilt in my collection. I am happy and I hope the rest of our group is as well. At least I hope they will be happy when they finish. I am relieved and happy that mine is finished. 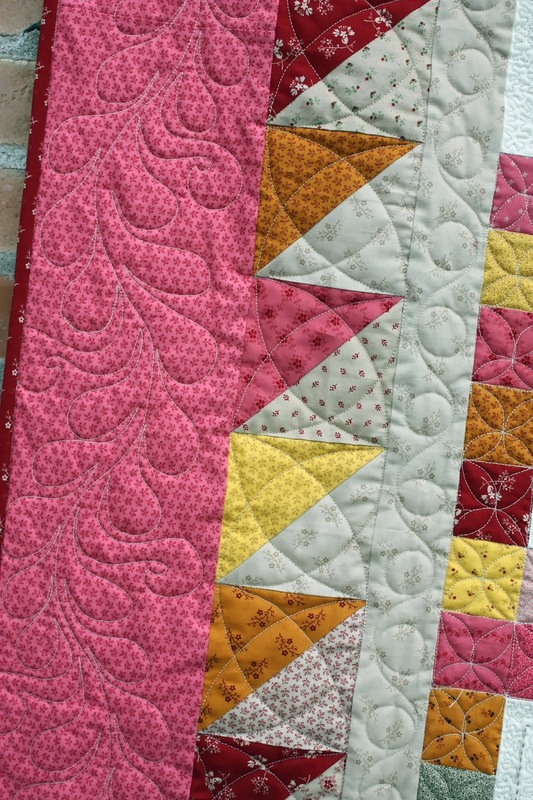 Now I just have one more difficult quilt to tackle this year and then I think I am good!! I love these! Can't believe how talented you are. The feathers look amazing. Keep it up girlie.